The program in the Middle School is arranged by departments to offer a planned sequence of courses which teach basic skills. Humanities, foreign language, mathematics, and science courses are required to be taken in sequence, though some students in the same grade may be placed at a different level in the foreign language or mathematics sequences. Fine arts courses are required at every level as well as daily physical education or athletics. The individuals and groups responsible for the Middle School academic program strive to teach strong study skills as they simultaneously reinforce the fundamentals and introduce more advanced concepts. The Head of Middle School works closely with teachers, advisors, class sponsors, and administrators to see that each boy profits richly from his Middle School years. Throughout the year, teachers write comments reporting the academic progress of their students. Boys in seventh and eighth grade receive grades in addition to faculty comments and are eligible for study hall release by earning a B average or better. The student may have one C, but there must be a compensating A in another subject. The Humanities grade is counted twice because the course meets for a double period and the material covered is equivalent to two classes. Students who earn study hall release for the trimester have the opportunity to study anywhere on campus during their normal study hall periods. Grades and comments should stimulate thoughtful and informed discussion between parents and their sons. Scheduled advisory conference days give parents the opportunity to meet with their son’s advisor to discuss the student’s academic standing, as well as his all-around success in the Middle School. A certain amount of homework is required in each Middle School subject. To be prepared for each day’s classroom experience, a boy must conscientiously complete his assignments, both written and cognitive. The wise Middle Schooler will schedule a regular time period of several hours each day for homework preparation. In fifth and sixth grade, a boy can expect 20–30 minutes of homework per academic subject each night, as well as an ongoing outside reading book every two weeks. Seventh and eighth graders can expect 30–40 minutes per academic subject each night. Good use of study hall time will give boys more free time during evenings. A “test” differs from a “quiz” in that a test requires special preparation beyond the normal night’s assignment, while a quiz covers material a student should know from having conscientiously completed his homework. Teachers give students a notice of at least three days prior to a test, and normally, students take no more than two tests on the same day. Though end-of-term exams are usually not given to Middle Schoolers, they often have a number of major tests at the end of each trimester. Eighth graders, however, do have scheduled exams in May which count for 10–20 percent of the grade for the courses in which they are given. In addition to tests which originate in the classroom, the E.R.B. (Educational Records Bureau) examination is the standardized test given in the Middle School and reported to parents. Students who are experiencing difficulty in an academic subject should meet with their teachers for extra assistance. At times, a student and his parents may feel that he needs a professional tutor. The Head of Middle School or the department chair should be informed or contacted for recommendations. In the case of a suspected learning difficulty, the School’s Counseling Office may recommend diagnostic testing. Based on the testing results, appropriate accommodations and recommendations will be implemented. Each year, several boys are asked to attend summer courses or complete summer work to strengthen their academic standing. When the School requires this type of work, it is necessary for students to supply the Head of Middle School with a progress report from the teacher at the end of the course. Most boys adjust to Middle School at St. Mark’s responsibly and successfully. However, there are occasions when boys do not receive offers of re-enrollment. These decisions usually follow a period of monitoring after the student begins to have problems. When the school decides not to offer re-enrollment, it is because the School does not feel that the student is responding well to the St. Mark’s program and that he would have a more positive academic experience in an environment that is less strenuous for him. The School is always willing to help such a boy find the right academic setting for his particular needs. Though most developmental problems are discovered in Lower School, there is still an occasional boy who is asked to repeat a grade. These boys are usually thought to have the potential for success at St. Mark’s but are slower in forming some of the developmental skills necessary for the School’s rigorous academic program. The Middle School follows a required schedule of courses in humanities, science, mathematics, and foreign languages. Fifth and sixth graders are required to take Exploring Asia and Spanish, while seventh and eighth graders are given a choice of Chinese, Latin, or Spanish to study. All students take a computer applications course. • The equivalent of one- and two-thirds years of fine arts courses from the full-year and trimester courses offered. • One full-year fine arts course or three trimester courses. • A sport or physical education for each of the Fall, Winter, and Spring seasons. • The recommended mathematics course (by the mathematics department). A new seventh or eighth grader with no foreign language experience should sign up for one of the following courses: Latin IA, Mandarin Chinese IA, MS Introductory Spanish (seventh and eighth grade), or US Introduction to Spanish (eighth grade only with Department Chair permission). NOTE: Though an attempt is made to honor all fine arts selections, it is sometimes necessary to assign a student to a different trimester course than he requests. Likewise, several sports have limited enrollment, and a student may not always receive his first choice. A typical course meets 45 minutes a day for either four or five days a week. Fifth and sixth graders will typically have at least three periods of scheduled study hall time per week. Students are urged to make their selections carefully. Once schedules are finalized, requests for changes to full-year classes should be made within the first two weeks of school. For one-trimester classes, requests for changes should be made within the first week of the start of the trimester. • Hunt Silcock Award for academics, athletics, and character. • Athlete of the Year Award for outstanding sportsmanship and ability in sports. • Outstanding Scholar Award for aptitude and mastery of all academic subjects. 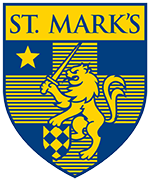 • Middle School Cup for outstanding performance in academics, athletics, and fine arts and for representing the values and ideals that St. Mark’s strives to instill in its students.